Looking for a reason NOT to join Beachbody? I’ve got 9 of them for you! 1. I don’t have the money to be a Beachbody Coach. WHAT?! This is an opportunity to make money, not an effort to make you spend it! Our first goal as a new coach is to cover the cost of your own products, and then we build from there. I was able to pay for my one time sign up fee in my first day of coaching. We never want you to spend money as a coach or, as I call it, “run a Beachbody charity”. This opportunity has totally changed my life financially. I was able to pay off unsecured debt (which was HIGH) and now we have extra money to do FUN things like travel and make improvements to our home and land 🙂 If money is a concern, then sadly, you are too broke to NOT do this. 2. I’m not a sales person. Would you consider yourself a sales person for recommending your favorite nail salon or restaurant to everyone you meet who is looking for one of those services? Of course not! It is perfectly natural to “sell” something that you personally love and maybe even feel passionate about. As a Beachbody Coach you are doing exactly that – recommending an awesome product that you love to someone who is looking for a solution to their problems. And in this case, you earn at least a 25% commission when anyone you share with decides to purchase. As a coach, I simply share my own story and the stories of others who have had success with the products – and people fill my inbox every day with requests to join my challenge groups. Just like that. 3. I’m not a fitness expert. Good – most of us aren’t and you don’t have to be! All you need to be successful is the desire to help others – no need to be a personal trainer or nutritionist. Really, we are just an accountability partner, friend, and fellow warrior on the road to better fitness alongside of our challenge group participants. We leave the fitness professional stuff to the makers of the Beachbody products who include everything people need in the DVDs and guides. 4. I don’t have enough time to be a coach. While Beachbody is not a get rich quick scheme, it is still not a business that requires a lot of time. Many coaches started while working a demanding full-time job, and many of these same coaches have since left their full-time jobs because they exceeded their full time salary (while only working part-time on their Beachbody business). I am at a point where working 2-4 hours a day, 5 days a week has afforded as much as $1600/week income. I do not regret finding the time to do this and you won’t either. 5. I’m not in good shape. It doesn’t matter! When I went to my first Beachbody event, I was so excited to see that Beachbody Coaches are all shapes and sizes. 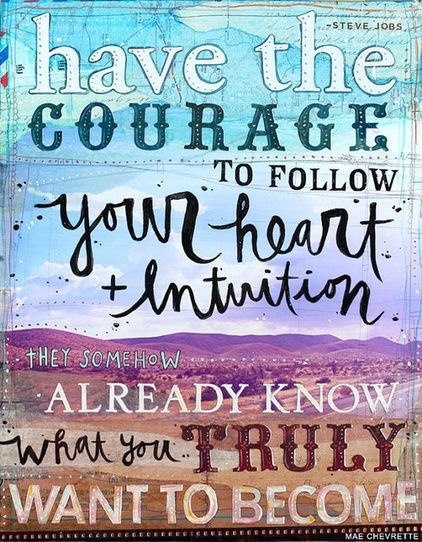 We are all at a different point on our journey – you may just be starting out and that is ok! People love to follow people who are struggling through the same things they are, or who have gone through it before, because they GET IT. 6. Beachbody is a pyramid scheme! This is the biggest misconception about Beachbody Coaching that I come across. Everyone wants to complain about pyramid schemes – except few people actually know what they really are. A pyramid scheme is an illegal business model that requires people to pay money to join and there is no actual product. Beachbody is a network marketing company, which is a business model that has been in existence for many decades. If you’d like more information on Pyramid Schemes vs Beachbody, let met know. 7. I need prior business experience. While this is a business and you must be committed to it, all we do is share our experience more than anything else. Beachbody spends millions of dollars each year on advertising, which makes the products a household name. Everyone has heard of P90X! You also don’t handle any of the products, or returns or processing – this is all done for you. I had no experience running my own business when I started, and it hasn’t stopped me from making my income and won’t stop you either. 8. Only the people that started first make any money! This is simply not true. Beachbody, like any network marketing company, is structured in a way that there is no limit on your earnings. The person that started before you might never decide to work their business and make nothing, while you could earn $50,000. You are not limited to what anyone “above” you is earning – the only person directly related to your earning potential is you. I did not get in early at all and it’s had no effect on my success story. So many people see their friends start up and then quit. Quitting isn’t how you succeed! I always tell people to be here one year from now, giving consistent effort throughout that first year. Learn from those around you who have been successful and follow their example. Success will not happen overnight – the ones who stick it out are the ones making the big bucks. Remember that this business is still a job, and you still have to work for it – you can’t sign up and do nothing and expect money to fall into your lap overnight. On the flip side, signing up with the right mentor who has an established and proven training system will make a huge difference. I have personally recruited many “former failures” from other companies and seen them to a ton of success because I work very diligently on their training, mentorship, and professional development. You might be shocked at your potential when these things are available to you. I hope this post lays to rest some of your misconceptions about Beachbody Coaching and gives you a little more insight into what the company does. 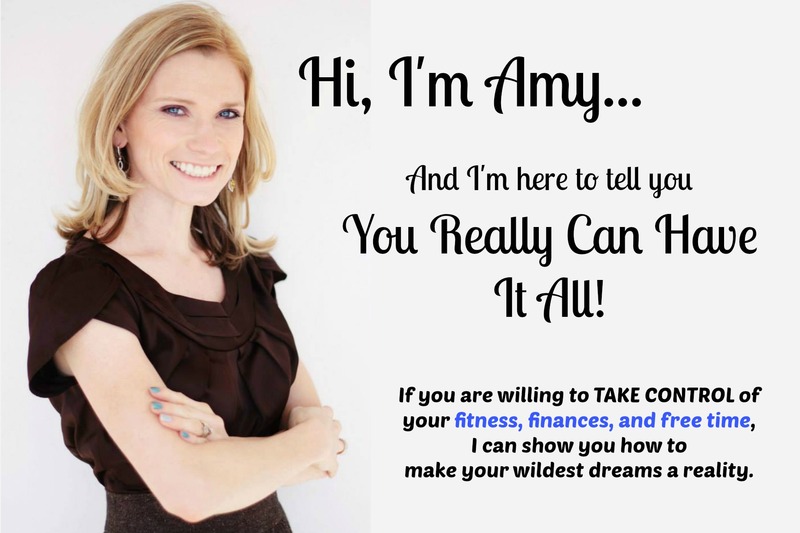 Do you have any other questions about Beachbody Coaching that I haven’t covered in this post? Ask away and I will do my best to answer them! Personal Development… do I really need it? and WHY?? A cool thing happened to me earlier this year. 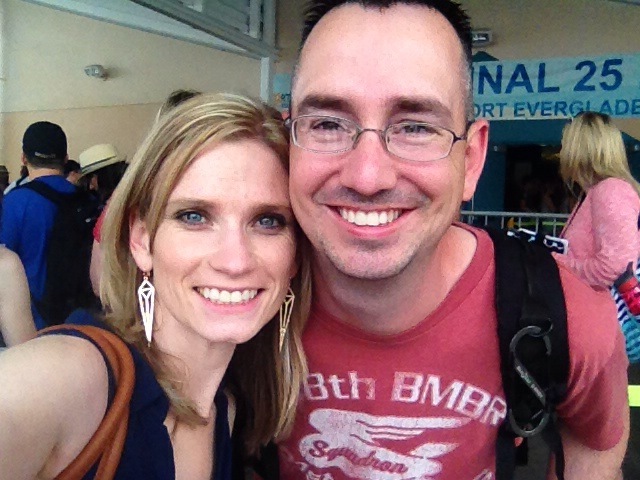 My husband and I went on a free cruise with Beachbody (that’s not the cool thing, although that was pretty awesome) and while we were there, he said some pretty sweet things about me. That is one of the best compliments I have ever received in my life. You see, I’ve always been a very shy person. Like I won’t ask where the bathroom is at the store shy. I won’t call the bank shy. And the fact that my husband, who knows me better than anyone else, has noticed my growth really made my day. It kind of made my year, I guess, since here I am 9 months later, still basking in the glow of that compliment. Clearly, Beachbody is a health and fitness company. But more than any other company or business that I have worked with before, they emphasize personal growth, and so daily over the past 2 and a half years, I have invested in myself. I read books about growth. I watch videos. I go to seminars. And every bit of what I invest in myself, I get to keep no matter what else happens in my life. To be honest, the first six months I was coaching, I thought the personal development portion was bogus and I didn’t do it. And while I had a moderate amount of success, it was nothing to write home about. I started to get stuck and my business wasn’t growing. And at that point, I thought “Well maybe it’s time to give this personal development thing a try.” And that’s when my business really started to grow. I’m making a plan. Rather than just reading whatever I feel like and attending events with no plan for the future, I made myself a personal development calendar. It includes books, events and online training programs for the year. In addition to attending 3 live events (aside from Beachbody sponsored events), I’m also going to read at least 24 personal developments, which I invite you to do along with me. As I finish reading these (some of them for the second time), I plan to write up a short review and share it here for accountability. No matter where you are or what career you are in, I invite you to join me in personal development this year. BONUS TIP: Goodwill or the Salvation Army is a GREAT place to find some of these books for a fraction of the price! Last weekend I found THREE of the books on my list for .99 cents EACH – score!! Throughout the course of making healthy changes to my diet, the one thing I’ve really missed is good popcorn. Last year for my birthday, my sisters got me an air popper, which is AWESOME, minus the fact that air popped popcorn tastes NOTHING like actual delicious, buttery movie theater popped popcorn. In fact, as my husband would say, it tastes a whole lot like cardboard. I did find one tasty recipe for Rosemary and Black Pepper popcorn, and it was good, but it wasn’t what I’ve been looking for and consequently, while I’ve done great resisting microwave popcorn, I’ve almost always caved and went for the artificially disgusting popcorn you can get from the movie theater… until now. This past weekend, my daughter, my husband and I decided to have a Harry Potter movie marathon. I volunteered to make popcorn. They both groaned and requested a trip to the grocery store to buy a bag of movie theater popcorn. But instead of subjecting them to cardboard flavored popcorn, a quick google search revealed that I may, in fact, be able to make a good substitute at home. 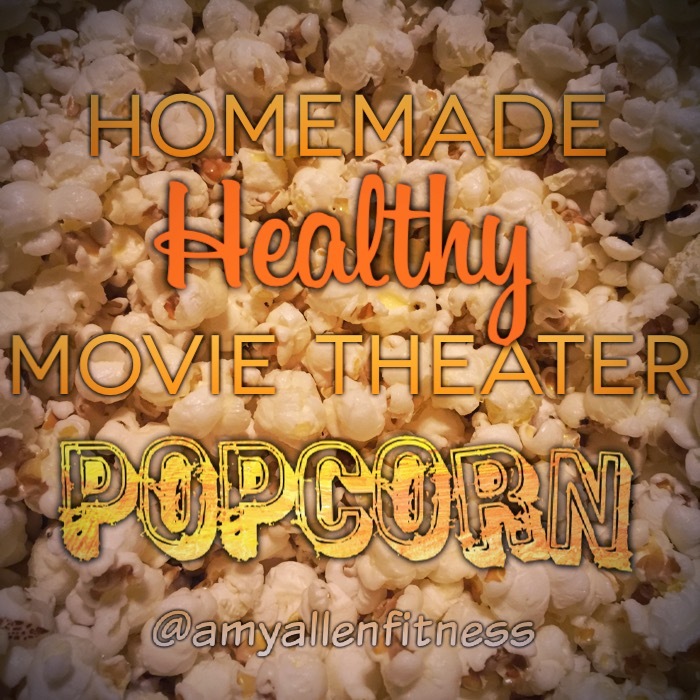 With just a few modifications, here are the results: Delicious movie theater butter popcorn, without all the unhealthy stuff – because really, popcorn in and of itself is not terribly unhealthy, it’s all the junk we add to it. 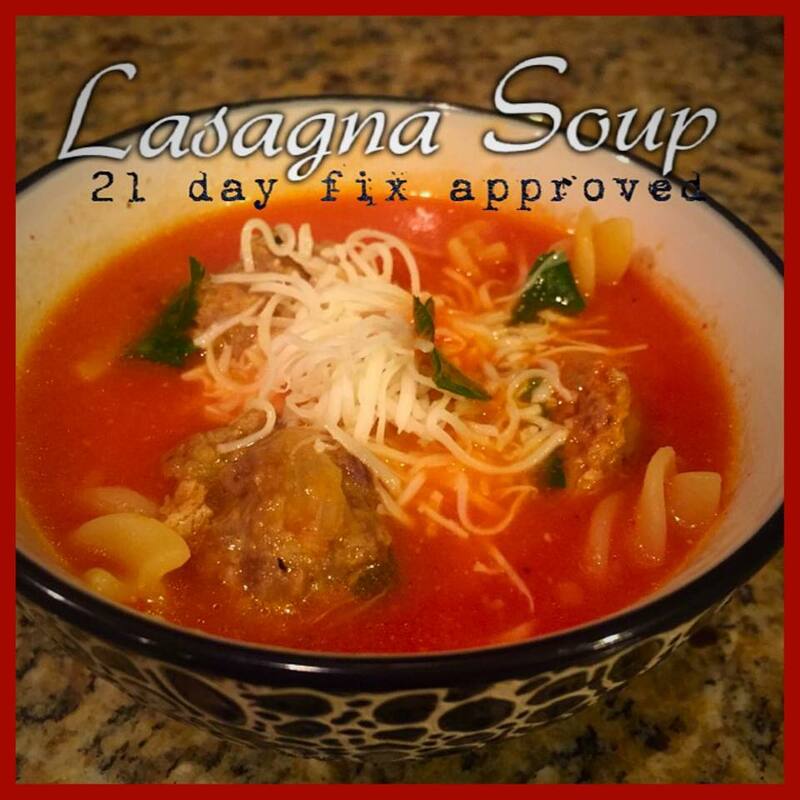 And while this isn’t 21 Day Fix approved, it’s an ok cheat once in a while. The secret is using Ghee (clarified butter) instead of regular butter, which makes your popcorn overly soggy and not tasty. Heat a saucepan over high heat – I used a 3 qt saucepan. Melt coconut oil completely. (You could use a different type of oil, but you won’t taste it. I was wary, but the popcorn did not have a coconut flavor at all.) Dump in 1/2 cup popcorn kernels and shake around in pan to coat them with the oil. When one kernel starts to pop, cover your pan so you don’t end up with popcorn all over your kitchen. When the popping stops, dump your popcorn into a bowl and drizzle with melted ghee. Add salt to taste and enjoy. Are you paying too much for Shakeology? 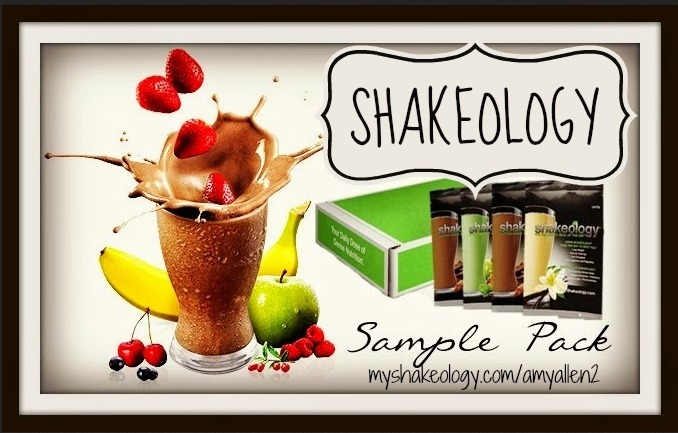 Are you paying too much for your Shakeology? Are you missing out on the huge monthly discount that everyone else seems to know about? If you are paying more than $97.46 for a month supply, then you are. 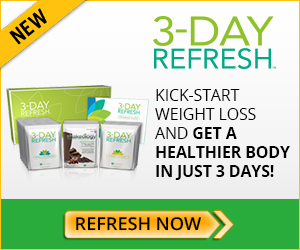 Shakeology is everywhere now days, and there is a good reason…It works. Where else can you find a food that is CHEMICAL FREE and contains more than 70 natural ingredients derived from rich, nutrient-dense whole-food sources from around the world? Where else can you find a food that curbs your cravings for sugar and junk food, promotes weight loss, increases energy, improves digestion, and increases your immune system? If you’re here, you probably already know about the endless list of benefits. Heck, you are probably already a fan and can’t live without your daily dose of dense nutrition. However, what you may not know is that you are probably paying too much for Shakeology through Amazon, ebay and a variety of other sources. This means you are missing out on a Shakeology Discount that others are receiving. The fact is, you can get a big Shakeology Discount and receive Shakeology straight from Beachbody to include their Bottom of the Bag Guarantee, for only $97.46 a month, and with only $2.00 shipping if you are on the Home Direct program (local taxes still apply). That’s 25% less than anywhere else. Cheap, affordable Shakeology right to your door. So What Do I Have To Do? 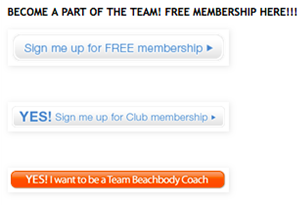 To get the Shakeology Discount, you simply need to become a Beachbody Coach. WHAT? GASP? NO? I CAN’T BE A COACH! I’m just starting my journey! I don’t have time! I’m not a trainer! I’m not a nutritionist! I can’t give advice! I just wanted to try Shakeology! Here’s the thing. NONE OF THAT MATTERS! If you want a Shakeology Discount, you can get one as a Coach AND that is it. You don’t have to do anything else. Our team has a bunch of “discount Coaches” that are simply Shakeology superfans and want to take advantage of the 25% discount. WHY NOT? For all of you coupon clippers and promo code hunters, this is a the equivalent Shakeology coupon code. With a Coach account, you are billed at $15.95/month (see below) but that entitles you to a HEFTY 25% discount on ALL Beachbody products. Think of that…25% discount on P90X3, Focus T25, 21 Day Fix, TurboFire, Body Beast, ChaLEAN Extreme, Insanity and more. And, of course, this includes all of their nutritional products, equipment and Shakeology! In addition to the $32.49 discount, you are saving approximately $14.00 in shipping too. 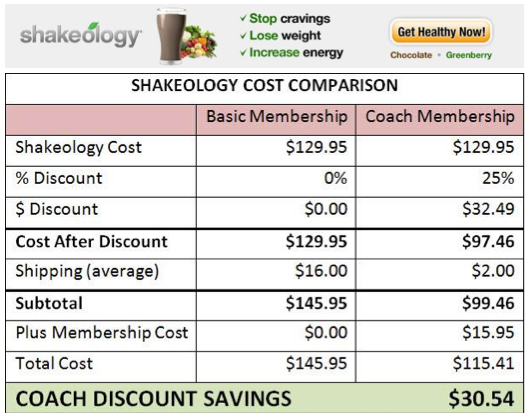 Even when you throw the cost of the monthly Coach fee, you are still saving an estimated $30.45 per month on Shakeology alone. Now that’s a pretty good discount, right? That’s $30.54 of real money…money that stays in YOUR POCKET! 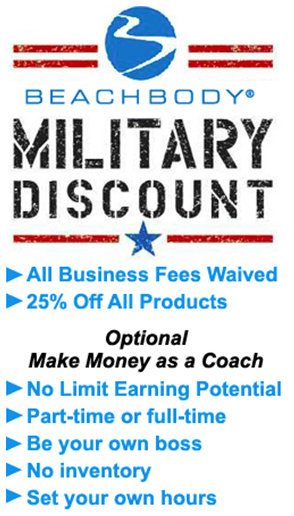 You have to start paying the $15.95 monthly Coach fee starting your second month (no fees for active duty military or their spouse). Take that Shakeology Discount over a whole year and that comes to $366.48 A YEAR! ($557.88 for active duty military). I Can Just GET the Shakeology Discount?? No Strings Attached? Yes! I became a Coach for this sole reason! I had been searching and trying different shake options for a long time. I was tired, drained and dragging and I needed an easy win for a meal. I learned I could get a discount as a Coach! DONE! AND…I could even send it all back after drinking the entire bag for a refund if I wasn’t satisfied! SIGN ME UP! How do you become a Coach? You can signup for FREE with the purchase of a Challenge Pack (Shakeology plus a workout of your choice at a discounted price) OR there’s a one time $40 setup fee. While a lot of people start as a Coach simply for the discount, they end up talking about how Shakeology dramatically accelerated their workout results to anybody that would listen. 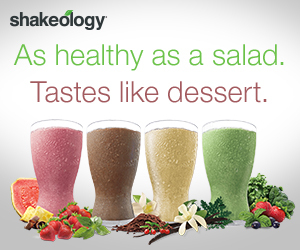 With Shakeology taking on the brunt of the nutrition side of the equation it helps make a huge impact in their life. When those people were interested and purchased anything from Team Beachbody, you then get 25% commission just for having the Coach account. That’s called a WIN/WIN. But you do NOT have to do this. You can just be a closet Shakeology drinker…like my husband ;). That just confirms my decision to make Shakeology part of my daily routine as it’s now become a staple for my family. So today, I encourage you to NOT pay full price for your Shakeology. You won’t be disappointed! ANNOUNCING MY 2015 COACH MENTORSHIP! I’m looking for 15 WOMEN who are ready to CHANGE THEIR LIVES. Fifteen women who want to be healthier, be happier, and are willing to work hard to achieve all you’ve ever dreamed of. I want to help YOU earn at least $20,000 in 2015, working from home a few hours a day. Considered working from home but you’re not sure where to get started? Tried a home business but it failed miserably? Thought about a career where you won’t have to spend 40 hours a week away from your family? Thought about traveling more but it won’t fit in your budget? Wanted to kick all your debt to the curb but you aren’t sure how? This opportunity might be for you!! I’m looking for 15 WOMEN to join me as business partners for 2015.
who are growing their businesses right alongside you. and write the blueprint for the future you have dreamed of!! Apply below for more details and to see if you’ll be a good fit for this opportunity! – Turn your time on Facebook into a job? – Find the time to get into the best shape of your life? – Take your family on the vacation of a lifetime… for free? – Make an extra $50 a week? How about an extra $500? Or more? – Help other women just like you do the same thing? – All while working just a few hours a day, from your own home? I can show you how to achieve all that and more! Who do I want for my team? I want POSITIVE PEOPLE who are READY to take their life to the next level and make it something AMAZING! I want MOMS who want to TAKE CONTROL of their lives to become HEALTHY and HAPPY … and want to help other moms do the same! to be able to learn from their experience. I want people who feel like something is missing, that they were made for MORE, and want to live their life by design. I’m able to stay at home and homeschool my kids while still helping my family financially. I’m able to make MORE working from home than I did working full time! I get to take my family on dream vacations like an ALL EXPENSES PAID trip to Disneyworld. I get to make amazing and rewarding friendships with other women every day. I’m in the best shape of my life, working out from home with celebrity trainers! I get to travel to amazing places like Argentina, Uruguay, Belize, Mexico, Grand Cayman, Laguna Beach, Tennessee… so far!…just for helping other women just like you get healthy! What does your dream life look like? 1 – Apply to join my mentorship program! If selected you will be personally mentored by me! 2 – Attend a Live Webinar! Let’s talk! I want to get to know you, share my story, and tell you exactly what I do and what you would be a part of! 3 – Discuss whether you are a good fit for the team and get started! Once you are officially part of the team we will set up a one on one call and get your business, brand started right! CLICK HERE TO SEE IF WE’RE A GOOD FIT! FAQ About Insanity Max: 30 – All Your Questions, Answered! Q: What is INSANITY MAX:30? A: Welcome to the craziest 30 minutes of your day—and the best results of your life! If you’re ready to push harder than ever before . . . and Dig Deeper® than you ever thought you could . 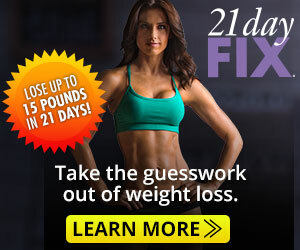 . . then Shaun T’s INSANITY MAX:30 can help you see results you never thought possible. Because it’s not about finishing the workout—it’s about seeing how far you’ll go before you MAX OUT. There’s no equipment needed in these killer cardio and Tabata-style strength workouts. Just push to your MAX and get INSANE results in 30 minutes a day! Q: Why is INSANITY MAX:30 effective? do anymore or you begin to lose form. Each workout pushes you to beat your last MAX OUT time to keep you accountable. Go one minute longer and you’ll get remarkably stronger—every single day. That’s how you lose more weight and get an INSANE body fast. Q: What makes INSANITY MAX:30 unique? A: Every day is a brand-new challenge in INSANITY MAX:30. With killer cardio, challenging Tabata-style strength workouts, plus 150 new moves designed to shatter your limits, Shaun pushes you to work harder, go longer, and MAX OUT later. It’s not about making it through all 30 minutes. It’s about pushing yourself more each day to get the body you’ve always wanted in 60 days. And even though INSANITY MAX:30 is a challenging program, the great thing is you can follow the modifier—whatever your fitness level—to MAX OUT and still get MAX results! 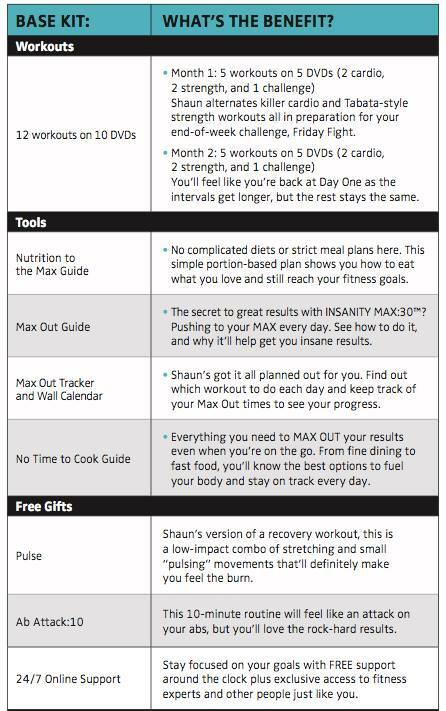 Want to be part of the FIRST EVER test group for Shaun T’s new program INSANITY MAX: 30!!? Having met Shaun T in person, experiencing this workout LIVE and listening to him explain how it was designed, I look forward to paying it forward TO YOU! It’s a life changing program and I want to assure you that ANYONE can do it. You will also get a free Insanity Max 30 t-shirt JUST for completing the program. By being one of the FIRST to have mind blowing results, you will be eligible for $500, $1000 and a $25K grand prize. Your body is going to change and you’ll start 2015 ON FIRE!!! Let’s MAX OUT! Have any questions? Post them here or send me a message! The official release date is DEC 2, so you are able to order anytime. The deadline to order and join our OFFICIAL TEST GROUP is DEC 9. I couldn’t think of a better Christmas present to give yourself, your family or a loved one. The gift of health is the gift that never stops giving. Please invite your friends and family. This is an open invitation to anyone who wants to get healthy, take it up a notch or keep the Holiday weight from creeping up. 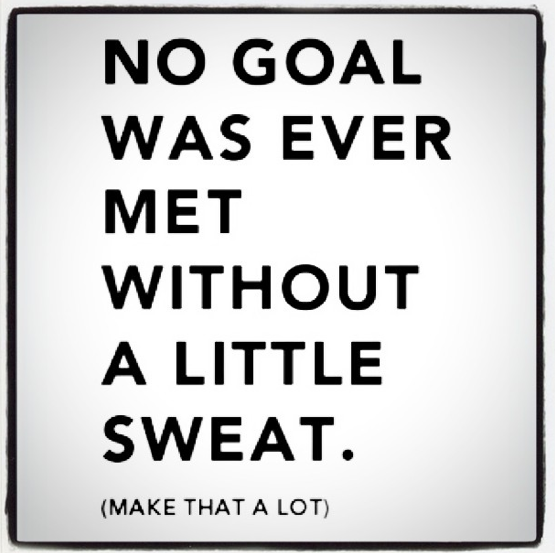 There’s no such thing as resolutions, just COMMITMENT! 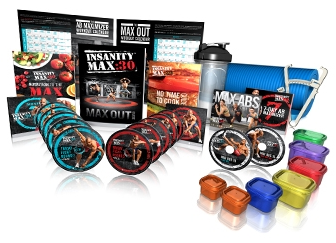 We will also be giving away a free copy of Insanity Max: 30 to one lucky customer. Just by joining the facebook event, you will be entered to win. Inviting your friends and family will earn you additional entries – just tag them on the wall. Mark your calendar and get ready to TAKE CONTROL of your health. Notes: I make the meatballs and pasta in advance, then make the broth. To make it easy to measure portions for the 21 Day Fix, I add them to the pan after the stew is prepared. It’s a little extra work, but it makes measuring easier. I also don’t add all the meatballs – I measure about 1 ½ cup into the stew, and then freeze the rest for next time. Add oil, onion, and garlic to the pot. Add a little salt and pepper to taste. Stir and cook until soft, 3-4 minutes. Add chicken broth and tomato sauce. Bring to a boil and add cooked pasta and cooked meatballs. Turn down the heat and simmer 5-10 min or until warm. Mix in Parmesan cheese, and fresh basil and parsley. Top each bowl with a mixture of mozzarella cheese and parsley. To make the meatballs,mix all meatball ingredients by hand in a large bowl. Roll mixture into bite size balls and place on foil lined baking sheet. You can brown these on the stove top before baking them, or just bake them. I like to bake just because it doesn’t use up an oil serving. Bake in oven for 15-20 min at 350. How many meatballs are in one serving depends on how big you make them. I measure out 3/4 of a cup and count these meatballs as 1 red serving. There is a small amount of cheese and onions, but I unless I’m eating the whole batch of meatballs (which I’m not), I don’t stress about it too much. I like to use these meatballs in my Lasagna Soup. You can find the recipe for that here!